Apparently more football players are taking their knees rather than standing and saluting the American Flag during American football games! If an entertainment business agrees it’s okay for their employees to act in such a disrespectful manner, so be it. Hopefully, if the audience votes with their feet, or their on/off switch, it’s no skin off my nose. I’m not particularly a football fan. That’s what Freedom of Speech and Redress of Grievances in a Free Republic should be! But start telling me what Speech is acceptable, and we may have words! Was the P320 Hammer Test Scientific? No. Did It Illustrate An Issue? Yes. There have been many comments left on our P320 hammer test video that dispute the validity of the test I performed with a hammer. I hate to tell you guys, but that was never supposed to be a scientific test. The reality of the matter is that I am flat out not set up for lab quality testing for failures with firearms, nor do I want to be. I have seen all of your comments but have been on the road and unable to spend the time fielding them as I would like to have. So why did I perform the test in the first place and why did I show you guys? Since the first news of the P320 drop safety failure hit the internet, I started having an extended conversation with a friend of mine who is well known for his aftermarket support of the P320. He and I spent some time spitballing what might be going on with the gun. As a result of those conversations, I shot the slow motion footage on my iPhone that made its way into the video. Did I look at the footage frame by frame before shooting the video? Nope. I shot something quickly a few hours before I was due to be at the airport and on my way to Rockcastle Shooting Center in Kentucky. I probably got a bunch of things wrong, in fact I know I got some of it wrong. 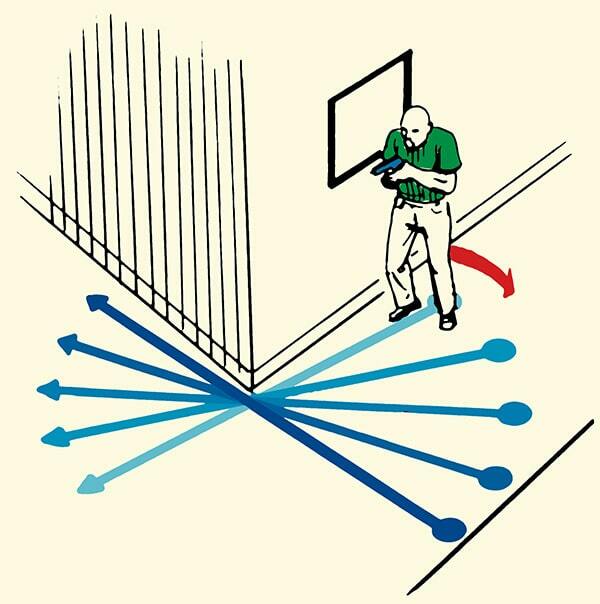 For example, the trigger only traveled 1/8″ rearward when the back of the pistol was struck and allowed the striker safety to be disengaged. We still aren’t sure what is going on with the sear allowing the striker to be released, but at this point, it doesn’t really matter. All we can do now is wait for Sig to get the upgraded pistols out to shooters and see if they fail in the same manner as we have seen the P320 do so before. You can watch the video above if you would like to see what video is being referenced. A number of governmental entities have adopted the P320. Then have walked-back their endorsement. The most prominent being, of course, the DOD. Seems there are some ‘safety’ issues. Like they fail drop and hammer tests. We never used to see such waffling in sales/promotion of firearms. While I’ve no dog in this hunt, I suspect LAWYERS are involved! No, I don’t have one. I posted the video below on my You Tube area yesterday. Then, it occurred not everyone reads the entire blog, or views the videos. I have posted previously about how Hollywood has officially run out of ideas. And my general loathing of remakes. I did like the original film, and even more the book by Brian Garfield. Charles Bronson as Paul Kersey? Sure. Bruce Willis in the remake? Double-sure! Apparently, they are only to be used by Black criminals!? The Art of Manliness strikes again! In 1944, the Allied troops were gaining ground on the battlefields of WWII, but still faced opposition from the Axis powers. The weaker that enemy targets could be made, the easier and faster the military’s job would be in wresting Europe back from its occupying forces. The U.S. government thus began a strategy to undermine Axis-aligned governments not only from without, but also from within. 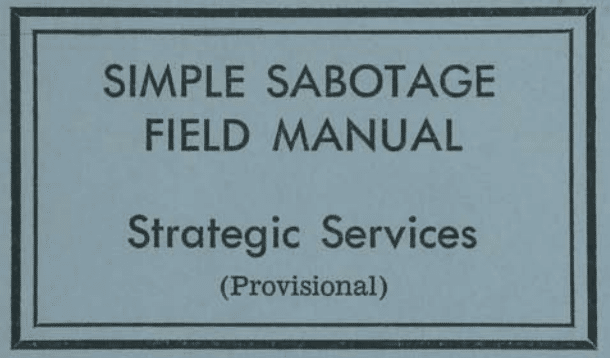 The Simple Sabotage Field Manual taught O.S.S. 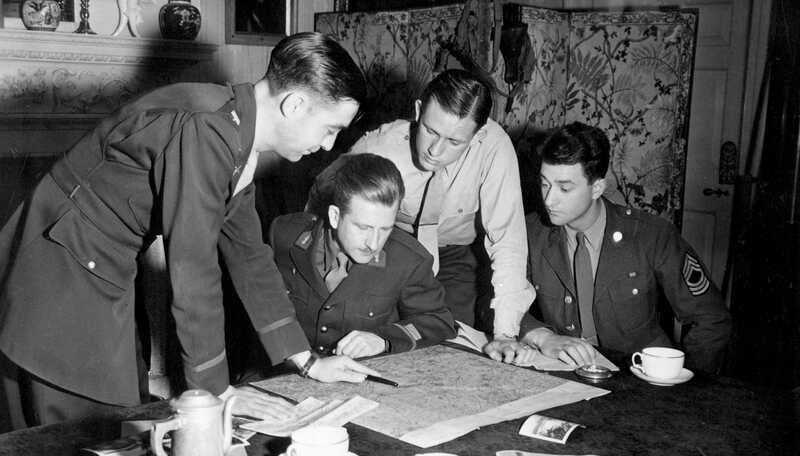 agents not only how to recruit potential saboteurs from among those who were antagonistic towards their occupiers and sympathetic to the Allied cause, but listed specific tactics average citizens in various lines of work could employ to destabilize their government and help hasten its demise. The booklet was declassified by the director of the O.S.S., William J. Donovan, with the aim of surreptitiously distributing its information by way of leaflets, radio broadcasts, or the direct teaching of European citizens who U.S. agents had ascertained could be trusted. Though the suggestions presented in the Simple Sabotage Field Manual were designed to soften the underbelly of the enemy by gumming up the works of factories, offices, and infrastructure, what’s hilariously surprising is how many of them, especially regarding white collar work, continue to be inadvertently (we think?) practiced today. When you read tips to employees like “refer all matters to committees, for ‘further study and consideration,’” and “Contrive as many interruptions to your work as you can,” as well as instructions to managers to “Hold conferences when there is more critical work to be done,” one realizes the ways in which, in the present day, employees sabotage their companies, managers sabotage their teams, and workers sabotage their own success — not for any purposeful mission, but simply out of laziness, carelessness, and a lack of motivation and morale. Further, the general injunction to “Act stupid,” uncomfortably invokes the fact that modern citizens may be sabotaging the strength of a country they actually support. The Simple Sabotage Field Manual thus cannot only be used as a handbook on guerrilla resistance, should you find yourself living under a tyrannical occupying government, but also a guide on how to “reverse engineer” success in peacetime pursuits — how to recognize and address would-be saboteurs in the cubicle next door (or in the mirror). Either way, it’s a fascinating read. Below we’ve re-published a condensed version of the booklet, collecting the tips that are the most interesting, and which still remain relevant today. (Numbering/formatting was changed in places by the necessity of the condensing process.) The entire booklet can be found here. Fight the power, and don’t forget to leave home without a bag of moths. What you do with it is your business.